THE Sunday Post has published a new book of old wisdom. For decades, your favourite Sunday paper ran a “Pass It On” column, week in, week out. Housewives, and some men, would write in with clever, innovative and frankly brilliant tips for cooking, cleaning, mending, ironing, saving money and . . . well just about everything you could think of that good and decent people did. 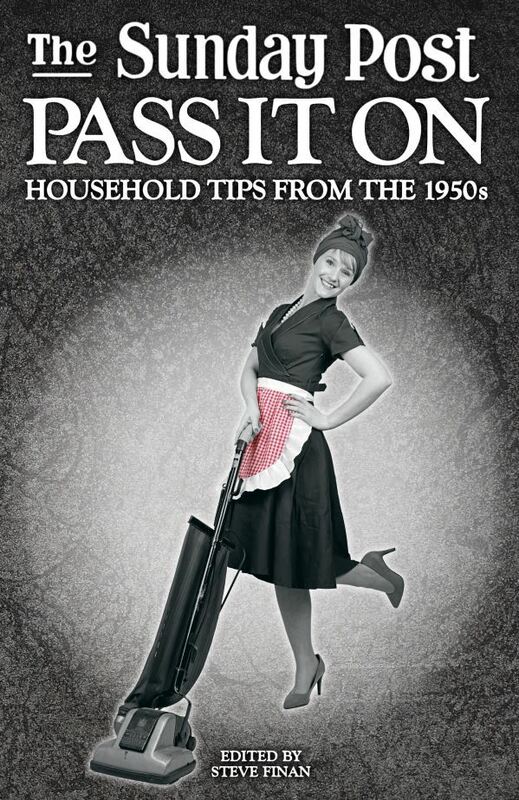 We have collected these tips from the 1950s, the era of the superhousewife, and collated more than 1200 of them into themed chapters. The tips are nothing short of brilliant – do you know why you should always paint clothes props but never paint stepladders? Do you know the best time to clean your oven, the surest way to clean your glasses or how to get water spots out of polished wood? Hundreds of the tips are still useful today. The others, whose time may have passed, invoke a powerful feeling of nostalgia. The Sunday Post gave a half-guinea or a pair of towels for the week’s best tip. However, the prize was only part of the reward. In those house-proud times, the woman who had a tip printed was regarded as a housewife of distinction. A woman who was thrifty, clever and kept her home spick and span. These were the days when families would compete to do the best job when it was their turn to clean the close. There could be no saving the reputation of a slovenly wife who left the stairs clarty. For those who reached the hallowed ground of a tip printed in The Sunday Post, a heavenly light shone for ever on their housewifely prowess. The cutting might be produced to impress friends and relatives. Others would tell their friends they lived next door to a woman who’d had a tip published as it was a general sign of living in a good neighbourhood. Men sent in tips too, of course, but the majority were from women – even the ones intended to give advice to the man o’ the hoose! The legend in The Sunday Post office (although never proved) was that when the Queen Mother was in residence in Scotland she read The Sunday Post (of course) and her favourite part was the Pass It On tips. She would regale the rest of the family and staff with the homely and clever advice. Proof that the Pass It On column was so full of handy tips that anyone, from Balmoral to the Gorbals, would find it useful. The tips are, after all, gleaned from experts who had to satisfy the most difficult-to-please judges of all, their own family. In the pages of this book, you can hear these women talk. If you close your eyes you can see them, rank after rank, year after year, an army of capable, hardworking, resourceful women. They have their sleeves rolled up, an apron on, there will be a pot of mince simmering on the stove behind them and a just-scrubbed table by their hand. They are you, or your mother, grandmother, aunt, or the woman across the street who told you off for misbehaving. They were the backbone of society, the centre of their family unit, the one you turned to when trouble arose. And The Sunday Post is determined to ensure their fame lives on. We have included the full names and addresses of all the contributors, just as they were printed in the 1950s. We think they deserve full credit and hope you will recognise someone you know – your mother, grandmother, aunt or neighbour. If your relative’s name is in the pages of this book then you should be very proud of them. Indeed, if you wanted to tell us their story, we’d be delighted to hear from you. These people were working-class heroes. They kept a “good clean hoose” and used their myriad skills to do everything your childhood was made of. They’d feed you the best soup you’ve ever tasted, they took up the hems on your hand-me-downs and scrubbed behind your ears with all the painful, loving vigour they could muster. They knitted your cardigans, bandaged your bleeding knees, made all that wonderful jam and polished all those cold lino floors. Their genius deserves to be recognised and celebrated. This book does that . . . and at the same time passes on well over a thousand nuggets of wisdom you’ll find are still extremely useful. It’s like having your wise granny’s advice at your shoulder as you live your life today. The Pass It On book is on sale now, but the official launch is at Waterstones, 35 Commercial Street, Dundee, on Tuesday, March 14, at 6.30pm. There is a further launch event at The Scottish Storytelling Centre, 43-45 High Street, Edinburgh, on Friday, March 17, at 7pm. Entry to both is free, all are welcome – it would be lovely to see you there. IS your mother or grandmother’s name here? Were they the sort of house-proud person who might have sent in a clever tip? If they’re not here, they might be in the book. ALL YOU NEED—When making a cup of tea for yourself and your husband, measure out just two cupfuls of water to boil. That’s all you need. It saves gas. —Mrs I. Taylor, 54 Roseangle, Dundee. SPOTTY WINDOWS—I got this tip from a garage man. To clean a smeary windscreen or window, wet it, then rub with a penny. Chamois in the usual way.—J. Wilson, Denton Holme, Carlisle. EASY CLEANING—To clean behind a wardrobe too heavy to move, put a dust sheet over the top at the back and pull it from side to side, working to the bottom. Dust and fluff comes down with the sheet and is easily gathered up.—Mrs G. D. Tilley, 195 Maxwellton Ave., East Kilbride. FLASK TEA—If tea has to be carried in a flask, it is better to carry tea bags. Fill the flask with boiling water and pop in a tea bag just before required. Let it infuse for a few minutes. This gives much fresher-tasting tea.—Mrs J. McLean, 86 Ralston Road, Campbeltown. IT STOPS THAT DOOR RATTLING—If a bedroom door rattles on windy nights, it can be silenced by stretching a rubber band between the two knobs. This cushions the door.—Miss Rose Parkhill, 74 Bushmills Rd., Coleraine, Co. Derry. WHEN YOU CAN’T GET YOUR COAT DRIED—If you get your coat wet and drying space is limited, place coat on a hanger and hang outside the wardrobe. Fill a hot water bag and suspend it from the hanger inside the coat. This not only dries the coat, but also smooths creases.—A. E. McIntyre, 48 Longrow, Campbeltown. TOWELS LAST LONGER—When dish towels get bare, stitch two together. The two-in-one lasts much longer.—Mrs J. Scott, Isleview, Allanfearn, Inverness. TIME SAVER—If you upset a box of buttons or pins, scoop them up with the edge of a postcard. Much quicker than picking up by hand.—Mrs Caldwell, 51 Colinslee Drive, Paisley. the drawer and lay a tray across it. —Mrs G. Robertson, 18 Keystone Avenue, Milngavie, by Glasgow. TEA-WISE—Don’t discard “empty” tea packets without unfolding the bottom. About a teaspoonful of tea is generally tucked away inside the folds.—Miss Betty Forrest, 16 Primrose St., Glasgow. AIR REFRESHER—Next time you make chips, cut an onion in half and place it on the plate rack above the cooker. You’ll find it an effective air-refresher.—Mrs I. Anderson, 36 Waverley Park, Bonnyrigg. CHICKENS—If you want to keep an uncooked chicken for a day or two and have no fridge, peel a large onion and put it inside the bird.—Mrs Reid, 22 Wilkie Crescent, Harleeshill, Larkhall. FOR SILK—When ironing taffeta or silk, keep a piece of paper smeared with a little soap on the ironing board. Run the iron over this now and again, and it doesn’t stick to the silk. It also prevents wrinkles, which are hard to remove.—Mrs A. McMillan, 201 Crossloan Road, Govan, Glasgow. BUTTER—When butter is hard, place paper wrapping over it and knead with knuckles or fingertips. Never heat, as this makes butter oily.—May Phillips, Linfern, Ballantrae.